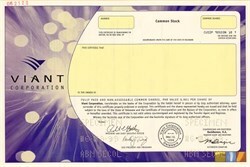 Beautiful engraved RARE specimen certificate from the Viant Corporation dated 1999. This historic document has an ornate border around it with a vignette of the company name and logo. This item has the printed signatures of the Company's President, Gett and Treasurer, Michael Tubridy. We only have one of these. Viant Inc. was a San Francisco-based internet consulting firm, founded in April 1996, that became one of the most successful web consulting firms during the early stages of the internet era. The company was founded by Eric Greenberg, and Co-Founders Robbie Vann-Adib� and Dwayne Nesmith as Silicon Valley Internet Partners (SVIP). It was one of the first consulting firms to attempt to integrate the disparate disciplines of strategy, creative and technology into a single value proposition and project approach. Such blended multi-disciplinary approaches have since become common. With investment from Mohr Davidow Ventures, Trident Capital and Kleiner, Perkins, Caufield & Byers it grew rapidly. Initially it was incubated out of the offices of CKS Group (prior to its merger with USWeb) in Campbell CA. An external CEO was recruited in Mid 1996 � Robert Gett from Cambridge Technology Partners, at which point corporate functions moved to Boston. Eric Greenberg left the company in early 1997, and subsequently founded Scient. The company changed its name to Viant in the spring of 1998. Its Bay Area offices relocated in 1998 to the South of Market area in San Francisco - 650 Townsend Street. 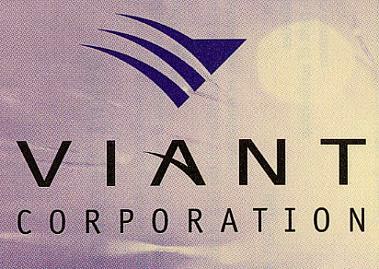 Original Viant Logo.Viant grew organically in the following years, with offices "spawned" by sending multi-discplinary teams from other offices into new geographies, including locations in New York City, Dallas, Chicago, Los Angeles, London, Munich, and others. The company went public in June 1999. By Dec 1999 it enjoyed a stock price of US$105 per share and a market capitalization of over US$2bn. Co-Founder Robbie Vann-Adib� left the firm in June 2000. Viant invested in a set of systems for Staffing and Project management and also Knowledge Management. These systems were sold in a deal with a start-up company Portera, which in turn were sold to Exigen and became the basis for its Professional Services Automation (PSA) business. As part of its activities, Viant worked with a variety of venture backed start-ups, incubating them by providing infrastructure, staffing to build the offering and other related services. Viant's activities in this area were quite successful with many of these companies surviving long after Viant.